Killer Characters: GOT 2 GO GUMBO! And... A GIVEAWAY!! GOT 2 GO GUMBO! And... A GIVEAWAY!! Hi there, y’all, I’m Tug Crozat. You’re probably more familiar with my daughter, Maggie, but I thought I’d drop by and fill you in on what all’s going on these days at Crozat Plantation B&B. Mardi Gras is a huge deal in Louisiana. In addition to a parade, a pageant, parties, and Courir de Mardi Gras - Mardi Gras Runs - we have a gumbo contest that we guy have pretty much taken over. 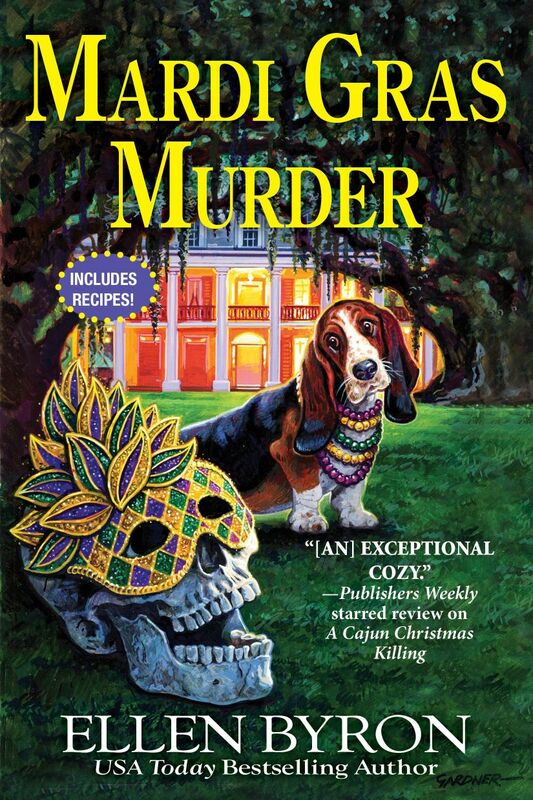 A lot of men in our village love to cook, and the only thing we like cooking better than jambalaya is gumbo. I always make mine a big old cast iron pot that’s so important to me I store it in our family safe between competitions. It’s been handed down to Crozat men from one generation to another. Nobody knows how old it is, but boy, do I love that baby. I always spend the week before Mardi Gras fixing up batches of my gumbo, making sure I have the right ingredients handy, doing a little fine tuning of the recipe, which I also keep in the safe. Crozat men have won the Pelican Mardi Gras gumbo contest more times than I can count. I got my eye on the prize again for this year. I can’t imagine anything going wrong. Can you? Readers, have you ever entered a cooking contest or wanted to? True confession: I always dreamed of entering the Pillsbury Bake-Off! 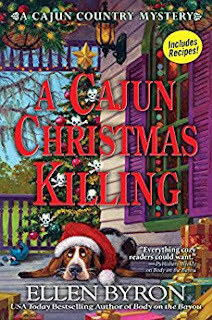 Comment to be entered in my Season's Readings contest for an autographed trade paperback copy of A CAJUN CHRISTMAS KILLING. (Kindle edition for Canada and other countries.) Perfect for the holidays! Contest runs from 11/17 through midnight, 11/20. Winner will be announced on Wednesday, 11/21. I have never entered a cooking or baking contest. I would buy the Pillsbury little cookbooks from the bake offs and I love the Great British Bake Off! I would love some gumbo and that cook off must smell amazing! I gain weight just WATCHING cooking shows, LOL. Hope you kept her recipes. Celia, that's awesome! To be honest, I'd opt for the wuss chili. I'm not a spicy gal. I love to watch cooking contests on TV but never have thought of entering them. I love to cook, but cooking on demand (a contest or a restaurant) is not for me. No, I have not. I like watching those things, but not entering myself. mcastor07 (at) gmail (dot) com. I have never entered a cooking contest or even thought of entering. I do like watching the Food Channel and the contests are some of my favorite shows. I LOVE gingersnaps SO much. Recipe, please! Great comments, everyone. An honest sidebar: coming up with the recipes for my books is sometimes the hardest part! I have dreamed of entering a cooking contest! My kids joke about sending me on Chopped! I love to cook and bake, but am less creative with baking. When I am cooking, nothing is ever done the same way twice! Thanks for this opportunity! I love cooking, but I'd never have the nerve to try a contest---I'm too much of a chicken. I've never entered a cooking competition. I do enjoy watching the ones on Food Network. I've never entered a cooking contest. Would love to be a judge for one (especially cookies). I won first place in 4H at the county fair for chocolate chip cookies. No, I've never entered a cooking contest! I do love my cast iron pot and skillets. I have never entered one but thought I would love to though. I think it would be great to win. I have never entered a cooking or baking contest. I can cook but I'm not that great at it. I have never entered or even thought of entering a cooking or baking contest. No talent here! But I would love for my Cajun husband to enter a cooking contest as, IMHO, he is a great cook! No, but I've been tempted. I have beat family with some baking though. Sort of an impromptu baking challenge. I've never entered anything like that but I thought about entering the chili cook off here because I make excellent chili;). Not entering, I have the book! I have never entered a cooking contest but I did judge the New Year's Day Cooking Contest one Year. I judges the black-eyed pea and discovered that for most contestants HEAT is their trying to make their concoctions stand out!!! Some of those recipes were awful and some were hard to task because my tadte buds were burned out. Instead of cheese between entries we were eating Tums. :) The vote was unanimous; the entry that taste most like regular black-eyed peas won. NEVER again but it was fun once. I did enter my Ozark Honey Oatmeal Cookies in the local, county and state fair this year. Didn't win the grand prize but did win first place in local and county and third in state. Since it was my first time entering, I didn't realize all that goes into it. Like a dummy I thought food contest was about the looks and taste of the baked item. However, when I saw the other entries at the state level hauling out chandeliers, china, and bud vases, I knew I wasn't going to win with just great looking, wonderful tasting cookies and my crystal serving dish. Seems it was as much about atmosphere as it was taste in that contest. My Momma always told me you can't eat atmosphere and it's the taste that will hook a man not looks. Guess I'm a chip off the old block! :) All in all a very fun experience and I can see me doing it again. Although not too sure on the state level just due to the fact that we live 2 hours away and it requires 3 trips to enter. I would love to compete on a more professional level and now that I've got a tiny bit of experience under my belt I would take my shaky knees, recipe in hand and go for it (albeit with more tricks in my bag this time). I've never entered a cooking contest. I have not, but my husband has and won! He is definitely the better cook in the family. I know better than to enter a cooking contest. I did however win a recipe contest that was put in a cookbook...it was for a South American slaw. Over the years and awhile back, I entered many recipe contests. Some were that you submitted your recipes and those which were chosen to enter with the prepared recipe at an event location, were then judged by a jury of chefs and local "personalities" for final judging. Other contests were done differently but almost all we're judged by bringing your prepared items to be judged. I won many times but my most fun time was when a local TV station in RI had a contest and you could enter your recipes in one or more of the 5 categories. Two of my recipes were chosen by this chef and others and my "prize" was preparing my recipes on an actual tv segment of this show with the chef. I spent a few hours taping while Chef James and I prepared the two recipes for later tv airing. It was so exciting to prepare my recipes with a tv chef (who was also a culinary chef instructor of Johnson and Wales) and then actually seeing the shows on tv the nights they aired was so much fun. So I've never done a big time Chopped show but I'll never forget my 15 minutes (twice) of tv time cooking with a tv chef years ago. I love to cook and to eat but I have never thought of entering a contest. Thanks for the chance to win. In 4H I won a blue ribbon for chocolate chip cookies at the county fair. Thank you all for the wonderful comments! I wish I could gift you all with swag or books, but finances dictate otherwise, sigh. Through a number generated by Random.org, the giveaway winner is Dianne Casey. Happy Thanksgiving to all! 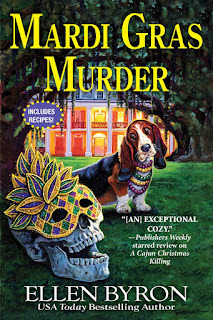 I'll be doing some contests in the New Year through my newsletter to herald the arrival of Mardi Gras on March 5th, so feel to sign up for it at http://www.ellenbyron.com/. Someone essentially help to make significantly articles I would state. That is the very first time I frequented your website page and to this point? I amazed with the analysis you made to make this actual publish amazing.